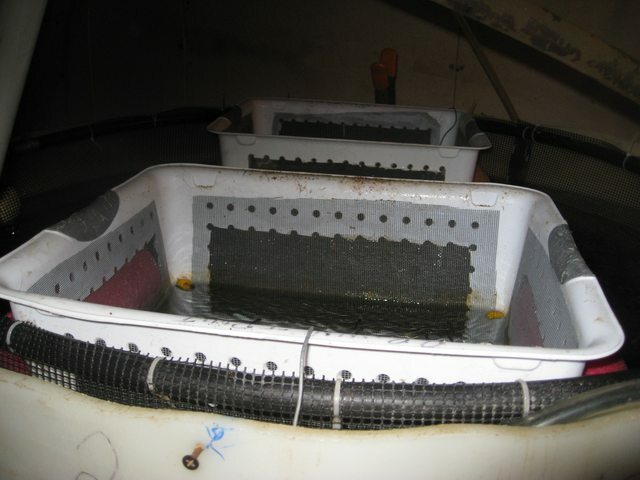 My 150 gallon circular fish tank in the basement uses a sieve screen mounted in a plastic tote, two sock filters, and an up flow sand filter for mechanical filtration. Biofiltration is two 55 gallon blue drums with plastic media that mix constantly via an 80 lpm air pump that also supplies air to the fish tank. A 1/2 hp chiller fed with a 10 gpm mag drive water pump keeps the water temp cold enough which can be digitally set. The entire system's water moves by gravity and a 15 gpm mag drive pump. 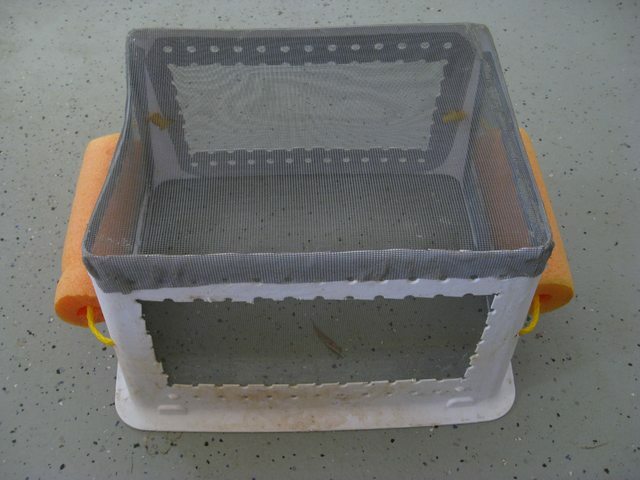 This is my second year hatching trout eggs in floating laundry baskets. 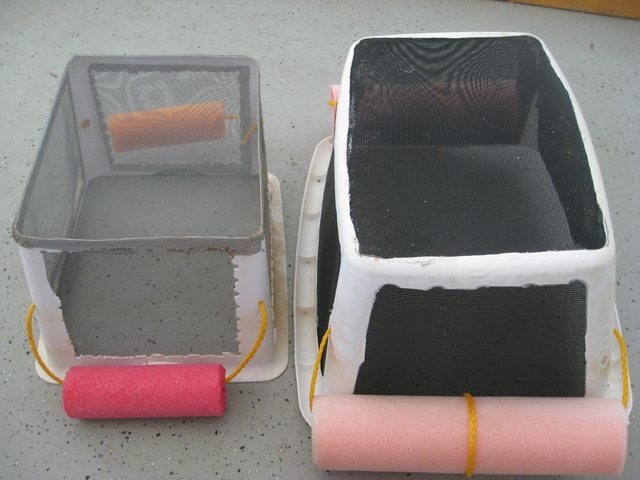 As you can see by the picture the laundry baskets have the bottom and sides cut out and nylon screen siliconed in. Some hatched fry in one of the baskets. For some reason the photo makes it seem like much less than there are. A couple of the baskets floating in the circular tank. If you look closely you can see a black water tubing and plastic mesh zip tied to it. I have built a circular cage with 1/8th inch mesh and essentially lined the tank with it. When the fry are large enough, I tip the baskets and liberate the trout fry into the cage, which has its bottom above the cone shaped bottom of the tank. One problem I had last time around with the fry, was most went to the bottom when liberated into the tank, and didn't evenly space themselves like other species I've reared. This way I can adjust the cage up or down to put them at whatever depth I want. Probably lower the cage as the size and density increase. Once it's time to liberate them into the pond I will move the cage to the pond and put them back into it. A larger cage with larger mesh will be around that cage and one more around that. 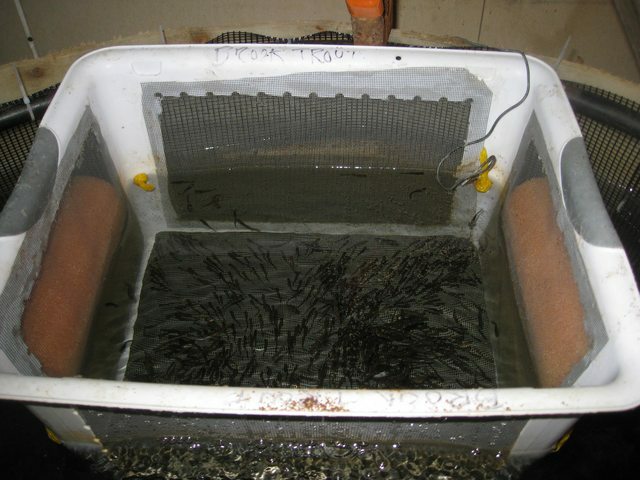 As the trout size increases the trout will be released into the successively larger cages with larger mesh. This protects the trout from predation of the larger free swimming trout in the pond and allows me to cull out the females in the fall, which don't sell as well as the males to my taxidermy market. The females also become egg bound if kept for another year, which ends up killing them. The females will be sold for other pond stocking in the fall for recreational fishing, through winter into the spring into ponds that get too warm in the summer. Most will be caught before they succumb to warm temps in those the ponds. My remaining males that are kept in my pond will be partially harvested and the rest allowed to grow another year. A brown and brook trout that were hatched December 2016 in the basement that were harvested November 2018. Just under 2 years of age in the photo. Fish are moved to a flow through outdoor pond in the spring at 4 to 5 inches in length. 10 to 14 inches by fall, average 16 to 17 inches the second fall. Should be 20 to 22 with some smaller and some bigger by the third fall. Brook, brown, and tiger trout eggs were Fedexed from the state of Utah USA overnight to Indiana USA. I am adding two more species the year: Rainbow/steelhead, and cutthroat trout. The rainbow eggs are presently incubating while the cutthroat eggs will arrive in April. For some reason the photo makes it seem like much less than there are. How many is it ? Believe it or not Ande there are between 300 to 400 fry in that basket. I started out with 500 brook trout and 500 brown trout eggs. 1000 tiger trout eggs due to high mortality. 1000 tiger trout eggs due to high mortality. I didn't know the tiger trout mortality, was higer. Is it as much as double that of brook & brown ? Would be cool if you ever found the time to write/illustrate a step by step article, on hatching and rearing trouts in a (your) diy ras. Yes crossing two different species as in the tiger trout causes high mortalities. One of the problems I have with with illustrating this step by step is the eggs through the alevin stage are very light sensitive. A camera flash is as bright as it gets. Could cause injuries. I sure hope I didn't screw up. I've been monitoring ammonia and nitrites and they've been reading as zero. Finally got around to checking nitrates and they were at least 160 mg/l! I did a massive water change right away. I hope I didn't so any harm to the eggs, alevins, or fry! I'm was getting some clogging of the screen in the baskets with the fry so I consolidated both the brook, tigers, and browns into a larger basket. The larger basket also has a slightly bigger mesh size of a fiberglass screen I found at the same hardware store. The smaller mesh is nylon. The one on the left is the original basket where two of them were used to separate the species. The one on he right has the larger fiberglass mesh screen where all three species have been consolidated. I had no success getting a close up to show the size differences with my camera. The browns are little larger than the other species as they hatched a little earlier, but I don't believe the size difference is enough to be an issue. And if past experience is any indication the brooks actually grown faster and are more aggressive than the browns. Contrary to most literature but it is what it is. The rainbows are still in one of the smaller egg baskets where 5 so far have swam up looking for feed. I plan on gently swapping out baskets as they clog, with a fresh clean one, by simply directing them into the fresh clean basket. Baskets are easily cleaned once removed with a garden hose and nozzle in a bathroom bathtub in my basement. 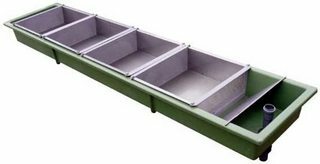 The plan next year is go with with a poly trough tank like this one (AES Pentair has one for under $300.00 with free shipping for orders over $50.00) and keep the system an RAS but instead of a circular tank this trough tank. The tank in the AES/Pentair catalog has the same volume as my circular tank. Note: I have the nitrates under control now by the simple flip of an electrical switch on the wall. I turn the mag drive pump off that is in my sump tank that runs the system by flipping the switch on the wall. This causes the water from the up flow sand filter to drain back into the sump tank. An overflow is attached to the sump tank which drains into the floor drain. About 30 gallons of water is drained off via gravity into a floor drain (the volume of the up flow sand filter). I do this once in the morning and once in the evening (30 gallons X 2 = 60 gallons which is 20 percent of the system volume). So a 20 percent water change per day to keep nitrates low. I then run fresh well water into the sump tank via a garden hose clamped to the sump tank . Once water started overflowing in the sump tank to the floor drain I know I am back to the the previous level. Nicely done with the laundry baskets, although seems like a lot of work to make. As an alternative you can use 50 mm pvc to make a floating frame, covered with oyster mesh, fixed with cable ties. Make them big enough so a box grader fit in and you can grade on size within 1 tank. Thanks Phri. Actually they are not difficult to build. Takes a little more then 30 minutes to cut out the pieces and cut the mesh material. Then siliconing in the mesh is easy. That said, may spring for a set of four of these for next year. Then place the fish into the rectangular tank as alevins if I can't find the trip warp material. I think I can built the cabinet out of square stock aluminum with snap in connectors and a few bolts. I'm all for a company making money but $346.69 plus shipping from Washington State for just an aluminum frame is a little much IMHO. I can even order the aluminum stock with wings on it to slide the egg trays on. I would weld but I have no experience in welding. Could also hire someone to weld it but with the snap ins and a few bolts there is no need. By building the cabinet I can just order the egg trays. I actually think I only need one judging by the low number of eggs I hatch. I was in error. The cabinet is $285.15. I think I would prefer the old style trough tanks, as you actually can see what's going on without opening anything, and thus this will enable you to pick up a problem hopefully before it becomes a disaster. It's a pity you are not closer as I have 4 of those laying around unused including 4 trays each. I do wonder if I would even need need a cabinet if I only need one tray. Seems to me I could set the tray up above a trough and just let the flow drop into the trough. I seem to remember hearing the fry can leave a tray once they swim off into a trough. Maybe if the top screen is removed and they leave with the overflow? Or was a different set up? I wonder what shipping would be from Australia the slowest way possible? Might still be less than the cost of buying them? OTOH it might not be as they would probably have to go by air vs. boat. A better picture of a California Egg Hatching Basket showing different mesh sizes for different egg sizes of different species. I contacted California Fish & Game to find out if they still used these and where I can purchase the mesh. Was assured my question would be forwarded to the property fisheries section. No response yet.